A home aquarium is such a lovely, interesting touch to any home, adding excitement and color. However, people often underestimate how much thought and effort needs to go into owning a fish tank. Indeed, as with any pet, fish need a lot of care and attention too. One of the key elements for any tank, even a small 10-gallon one, is a filter. These remove all of the nasty chemicals and toxins which may linger in the water. They also ensure the oxygen levels remain high, to keep your fish breathing. In general, a filter will help to ensure your fish continue swimming around happily, without danger. In this article, we’ll discuss the main factors to look out for when purchasing a filter for a 10-gallon aquarium. After all, the combination of effectiveness combined with value for money is what we like to see. We’ll also teach you a little bit of the science behind how fish remain healthy despite potential living conditions in such a small environment. You wouldn’t believe the muck which accumulates at the bottom of some of these tanks. Not only are waste materials from the fish present, but rotting food and dangerous chemicals can build up as well. It’s important to know what our fish are exposed to, so we know how best to operate our tanks. We’ll finish by naming the seven filters we think work best, so you can make an informed decision on the best filter for your 10-gallon tank. Does a 10-Gallon Tank Really Need A Filter? Which Type of Filter is Best? Although your 10-gallon tank might look pretty small and easy to keep clean, all tanks need a filter. Indeed, as you’ll see, it’s not just about what’s visible in the water that needs cleaning. It’s about the hidden chemicals and processes which occur in the water which really matter. What you don’t see are the toxins that can be released from excrement and rotting food. These can be genuinely poisonous to your little fish, so it’s essential to keep the water clean of such chemicals. One of the important processes which remove these toxins is the nitrogen cycle. Of course, this is something the water will do naturally in larger bodies of water. However, in small, enclosed environments such as an aquarium, it is essential to help it along in some ways. Let’s take a look at this cycle to show why it’s so important for your fish. This should make it a little clearer as to why you need a filter for any home aquarium. The nitrogen cycle is a chemical reaction which takes place everywhere, both in the earth and the water. 78 percent of the Earth’s atmosphere is made up of nitrogen, which makes this process extremely important to us. In bodies of water such as oceans, rivers, and lakes, the nitrogen cycle looks a little different to what it does in our aquariums. Nitrogen from the atmosphere precipitates into the water through condensation and rainfall. Then, nitrogen fixation occurs, the process of converting nitrogen into nitrates and nitrites, by cyanobacteria. This makes it edible for phytoplankton to consume, continuing the cycle. The phytoplankton synthesize this organic matter in their bodies, producing urea and ammonia as waste. This excretion sinks to the bottom of the water and is then nutrified by bacteria living deep below. The good bacteria converts it back into nitrates and nitrites, which are then denitrified to become nitrogen once more. This part is particularly important, as ammonia is toxic to many underwater creatures. Now, in an aquarium, fish waste and decaying uneaten food puts ammonia into the water. Similar to the process described above, ‘friendly bacteria’ are needed to convert the ammonia into less harmful chemicals: first into nitrates, and from there into nitrites. And finally these are removed during water changes. But how can we facilitate the process of bacteria converting one chemical into another in our aquariums? This is where filters can come in handy, to make sure the cycle is established effectively. Contrary to popular belief, a filters main purpose is NOT to remove large particles from the water, but is instead to provide a home for many billions (or more) of friendly bacteria, and to continually cycle a tanks water past them so they can convert chemicals in the water into ones less harmful for fish. There are a number of filtration stages within most aquarium filters. We’ll focus on the major three—mechanical, biological, and chemical. This stage of filtration physically traps particles from your water, such as food and decaying plants. This type of filtration comes first in the partitions of staged filtration. Indeed, these are the largest pieces of dirt you’ll find floating around your tank. Therefore, when installing a filter, you must ensure that the mechanical side is the part which the water hits first. This will get rid of larger particles which may otherwise get stuck inside the smaller working filters. The second stage of filtration is the stage which encourages the nitrogen cycle. This section is usually cermic hoops, a sponge, anything with a large surface area. Biological filter media support the bacteria which transforms the toxic ammonia to nitrates and nitrites. This is necessary for ensuring your fish remain healthy and happy in their habitat. This is the final filtration stage of most aquarium filters. It commonly uses activated carbon, removing any impurities from the water that the other filtration cannot. These include organic pollutants, metabolic waste, proteins, hormones, and other chemicals. Although there is the risk that the activated carbon could reduce oxygen levels in the tank, this can be rectified. Simply soak it in water for an hour prior to insertion into the filter, and it’ll do fine. Do note it will also remove any medications from water, so be mindful of this and remove chemical filtration if you are medicating your fish. It’s difficult to decide what tools and equipment to purchase for your tank with so many to choose from, it can be quite overwhelming. This is especially true when it comes to filters with so many types available, as well as many tens of models available for each type. There are simply hundreds – or more – to choose from. So, first of all, let’s cut through the details, the pros and cons of each type of filter available. External power filters – also called canister filters – are plugged into a power outlet and sit outside your tank. This is ideal for anyone who may have a bit of extra space around their tank for a bulky addition. These are often used for smaller tanks which cannot afford to waste space within the tank for filters. Indeed, smaller tanks, such as those of just 10 gallons, require all the space they can get. But also, these are some of the very best, most efficient filters available due to their size, capacity for holding lots of filter media, flexibility in allowing you to change what media they hold, and the fact they can turn over such huge volume of water per hour. Generally speaking though, for a 10 gallon tank, you would look for something small and quiet. These hang onto the edge of your tank, filtering water through their mechanism from the edge. This means that they take up minimal space within your tank, as well as outside, giving you the best of both worlds! A HOB is a great option, because not only are they highly accessible for maintenance, but they’re also partly submerged underwater for minimal noise. These filters are small, and fit snugly into a corner of your tank. Usually, the majority of these will remain underneath the water, with a little tube emerging from the surface. This makes it easily removable for cleaning purposes, without taking up much room in the tank. Like the average corner filter, these remain tucked away, but with a visible three-layer mechanism. This is made up of cotton and stone layers, filtering your water to enhance oxygen levels and purify the water. Ultimately, they can be useful, as you can customize how many layers you want. Therefore, if you purchase a larger or smaller tank, you can compensate by adding or removing layers. These are fully submerged underwater, making them a little harder to access. This also means they can take up valuable space in the tank, especially a 10-gallon one where space is already limited. They come in a number of shapes and sizes and can easily be concealed within the shrubbery or decorations of your tank. So if you’re going for an aesthetically pleasing look, this may be the one for you. This type is long and flat, and lays easily and invisibly concealed under the gravel, giving this type of filter it’s name. This makes them great for anyone who wishes to hide their unit out of sight. However, due to the gravel above it, the effectiveness can often be diminished. Generally, they’re pretty old-fashioned, but if you’re concerned about looks over effectiveness, then this may be suitable for you. These are exactly as they say in the name—filters made mostly of sponge with little else to them. Concealed within a plastic housing, an air pump is used to bubble water up through them which is filtered through a number of spongy layers, which can work rather effectively. However, after a while, they can become rather dirty and turn into a nest for bacteria. Therefore, they have to be cleaned often, and replaced fairly frequently, which is worth bearing in mind before purchasing this bulky filter. Generally, we would not recommend undergravel or sponge filters, as they’re a little old-fashioned. Not to mention, they’re not particularly efficient and are difficult to access without turning over your entire aquarium. The other internal filters will take up valuable space within your 10-gallon tank. 10-gallon tanks are not particularly large to begin with, so anything too obtrusive may leave less room for your fishy friends. Therefore, when it comes down to it, either an external canister or a hang-on-back type is best. When purchasing your filter, there are a few factors to look out for to ensure you get the best one for your needs, and the best bang for your buck. Below, we take a good look at what you need consider, so you know how to choose from all the options. Size matters when it comes to 10-gallon tanks, which are rather small. Therefore, any filter that’s too obtrusive to the tank’s space and fish is a bad idea. For example, there are a number of internal models which you attach to the side of your tank. These include corner or box filters, which you can hide within the plants of your tank. These may get in the way of your fish, obstructing their natural habits and limiting the amount of fish you can keep in the tank. Of course, if you can find a small one to attach within your tank, then this may do the trick. Indeed, anything long and slim, which sits close to the tank wall, will most likely work well. However, it’s best to get external filters or hang-on-back types for added space within your aquarium. Furthermore, you really don’t want a filter suitable for a tank much larger than your 10 gallons. The flow and currents in the water generated would be too strong for the smaller tank and the fish in it. Naturally, if your fish enjoy a more aggressive flow, this is fine, but most will not thrive in such harsh environments. As discussed previously, there are usually three stages to the filtration process. These include mechanical, biological, and chemical. Not only do these processes keep your tank clean, but they also ensure oxygen and nitrogen levels remain normal. Therefore, it is important to make sure your filter does mechanical and biological filtration, at least. However, if possible, chemical filtration should also be available for times when it’s needed. There’s nothing worse than opening up a new gadget and having a huge set of instructions to follow. You really do want something that will take minimal time to assemble. Then you can waste no time, and start using it straight away. If you’re a beginner with fish tanks, you want something quick and easy for minimal stress. Try to look for a product where the ease of set up is specified. While this is definitely not the most important feature to look for in a filter, it’s still something to be considered. Naturally, if you are a seasoned enthusiast, something more high-tech may be desired. Effectiveness is the ultimate goal for any new product you spend your hard-earned money on. This goes hand-in-hand with the three processes of filtration; if it does these, then it should be a winner. However, what we really want to know is if the product actually works well. Reading reviews and ratings is often a great way to see if the product does what it claims to. In our list below, we’ve specified some of our top products to buy, which all work effectively, according to a large number of consumers. As with anything you purchase, you want it to last. Generally, most filters will be made from plastic, which actually lasts really well in an underwater environment. Indeed, these are less likely to get blocked or dirty. Nevertheless, if you go for a metal product, it’s important for it to be stainless or rust-proof. That being said, all of the products we list below are made of durable plastic materials, so you can be confident these will last..
Additional features on your filter that other products don’t have is a bonus. Just make sure the extra features are useful and will actually benefit your tank. For example, some models promise a five-stage filtration process, but this is almost always never necessary—three-stage filtration is perfect for the home aquarium. Therefore, don’t be tempted to purchase something more expensive if it won’t add anything useful. Filters with adjustable flow rates and directions are available. These work particularly well for any fish which require perhaps a slower water rate and are good desirable features..Some products self-prime / self start, doing almost all the work for you. This is fantastic for a beginner or someone who has less time to invest in maintaining their fish tank. Ultimately, if you’re looking for particular outcomes, like ease of use, or effectiveness, then these additions may be a worthy investment. 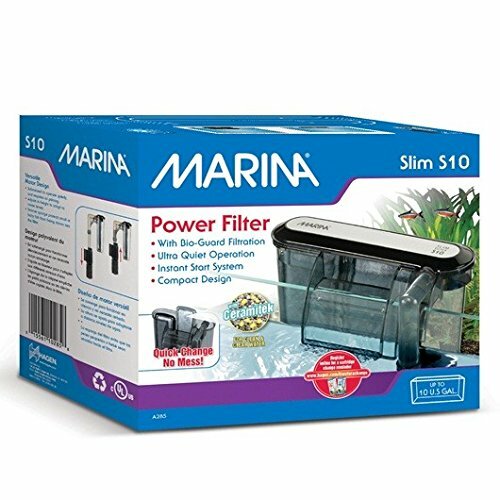 If you’ve recently purchased a 10-gallon aquarium and need your first filter, then look no further. Or even if you’re an old hand at owning fish, you may just need a replacement and want to know the best of what’s available? You’re in luck! Because below, we’ve provided our recommendations for what are, in our opinion, the seven best filters for a 10 gallon tank. The Aqua Clear power filter is quick and easy to install, with a filtration volume six times larger than other similar products. It comes in a number of sizes, which you can choose on purchase, making it quite versatile. It also has a controlled water flow for all different fish types, including those requiring a more delicate environment. The hang-on back nature of this filter means it doesn’t take up much of the aquarium space. This is great for a 10-gallon tank, so your fish have the freedom to roam without obstruction. This also makes it much easier to maintain and clean, as it is easily accessible. In fact, you don’t really have to disturb the water environment much to remove it. The built-in cycle guard produces superior water quality, alongside continuous biological filtration. This ensures that the all-important nitrogen cycle, as we have discussed before, is carried out continuously. Dimensions: 4.5 inches x 7 inches x 6.5 inches. Activated Carbon and BioMax included. Comes in a number of sizes to suit different tanks. Hang-on back, so takes up less space in the tank. Sand substrate may block the filter. This HOB filter is slim and compact, adding a functional touch to your aquarium without being a noticeable bulky machine. Even without this slimmer model, a HOB is ideal for space saving. Therefore, this just provides that additional sleekness for optimum space. Furthermore, this filter has a controllable water flow. As noted previously, some fish, particularly poor swimmers, prefer calmer water conditions. This filter works well in this situation, making sure your more delicate fish are out of harm’s way. The submerged motor also guarantees quieter filtration. Moreover, as the product does not require priming, this makes it super easy and quick to set up. It’s perfect for a beginner or anyone who likes ease of use. Finally, the two included filter media cartridges provide flexibility. The Bio-Carb and Bio-Clear cartridges contain Ceramitek, which encourages the establishment of friendly colonies of bacteria, facilitating the operation of the nitrogen cycle. This means you can rest assured that balanced and healthy water parameters will be maintained. Dimensions: 3.7 inches x 7.3 inches x 6.5 inches. Media cartridges included for added functionality. Hang-on back design doesn’t take up tank space. Some owners have found it to be noisy, or to produce an audible hum. Most are happy, but enough have said it to make it worhty of being noted. This filter is ideal for anyone with a smaller tank set-up. It’s also great for any aquarium beginners who require quick and easy to set up equipment. Two other sizes are available, for 5-gallon or 20-gallon tanks. To find out more, click here. This fully submersible, lightweight filter attaches to the inside of your home aquarium. This means it cannot be noticed from the outside—great for anyone who wishes to keep their tank looking sleek. However, it does mean it takes up valuable space inside the tank, reducing the volume for your fish. It can be attached horizontally or vertically, so you can pop it into any area you may have to spare. It also comes in four different sizes, so is ideal for any tank of 10 gallons or more. Due to its three-stage filtration process, clean water with stable parameters is fully supported, with the option of providing active carbon for removing trace chemicals, and dense foam particles for catching debris, this filter promises optimum productivity. Additionally, adjustable flow rates, direction, and height mean you have complete control over any currents and water movement in your tank that’s generated by the filter. Dimensions: 2.8 inches x 1.5 inches x 5.4 inches. 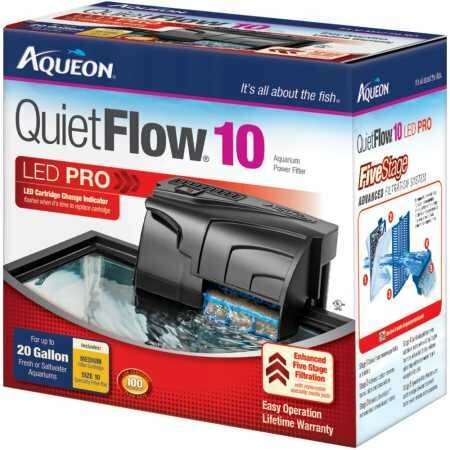 Uses Aqueon Replacement internal filter cartridges. Adjustable flow rate, direction, and height. Three-stage filtration for optimum functionality. Not easily accessible for cleaning. This HOB filter is available in a number of sizes, suitable for 10-gallons up to a 75-gallon tank! With higher flow rates than the average filter, this is ideal to provide cleaner water and higher oxygen levels for your fish. Furthermore, it includes an internal pump which lessens noise, despite these high flow rates. This provides a quieter mechanism, while still ensuring maximum functionality. Its five-stage filtration, alongside the specialty filter-pad and certified flow rates, provide excellent filtration and water circulation to ensure safe water and maintain a healthy environment. The biological grid has a large surface area that supports the bacteria which process the ammonia and nitrites into safer nitrates in your tank. Furthermore, the added benefit of an LED light, which flashes to indicate clogged cartridges needing replacement, is a great idea. This works by monitoring actual water flow levels, so it alerts you when water is not being filtrated. There is also minimal setup, due to its self-priming feature, making it great for beginners. 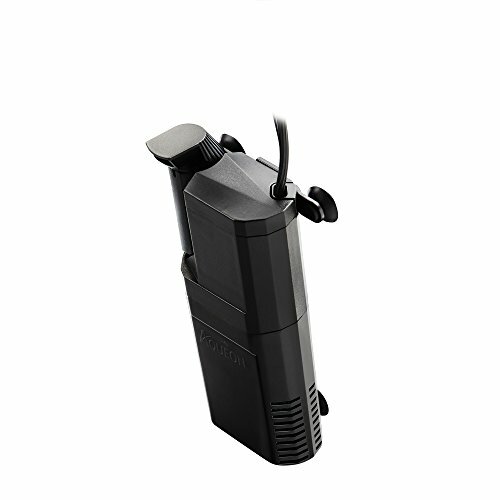 Finally, the self-cleaning mechanism makes this a super easy tool for your aquarium. Simple maintenance is always a bonus! Dimensions: 6.4 inches x 6.3 inches x 3.8 inches. LED light flashes to indicate replacing filtration media. Certified flow rates for improved fish health. This filter seems to have everything you need. It’ll work great for a beginner, or perhaps someone who’s just a little forgetful. If you want to keep your fish happy and healthy, then follow this link to find out more. 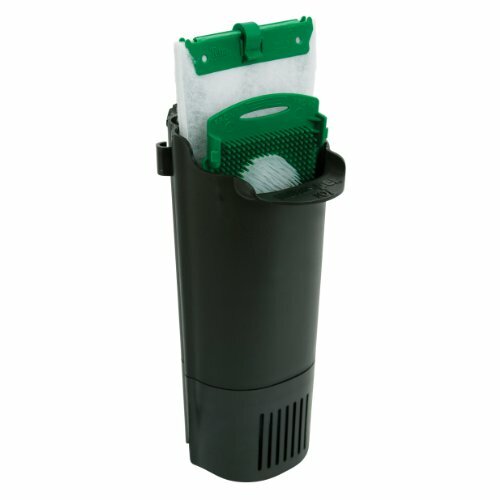 This external filter works well for fresh or marine aquariums. 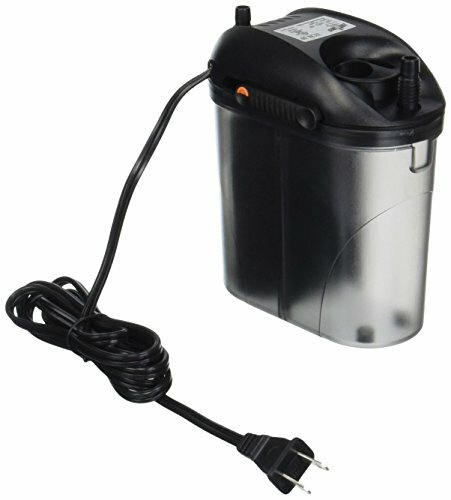 It makes a versatile addition to your home tank, filtering up to 80 gallons per hour. It’s easy to set up and the easy priming nature means it needs little effor to get going. This makes it ideal for any beginners who may be new to the fish business. Furthermore, the three-stage filtration system ensures optimum water cleanliness. The adjustable flow control system means that fish of any type can thrive in its conditions. This includes any who need a lower rate of flow so as not to be swept away. 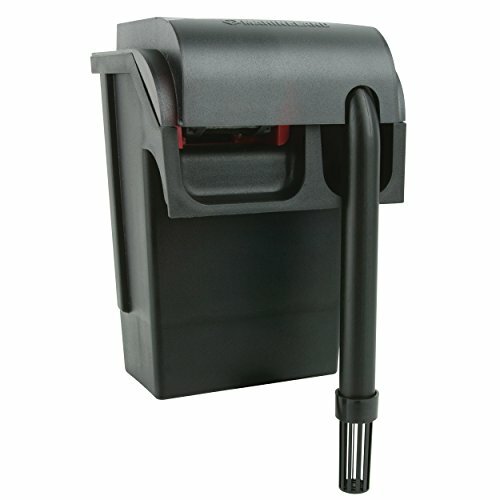 Finally, the filter head is easy to open and does not have to be unplugged or moved around to be cleaned or maintained. Dimensions: 11.3 inches x 4.8 inches x 5.8 inches. Sits outside of the tank so does not reduce volume of water for fish. Must sit outside the tank, so cannot be concealed. 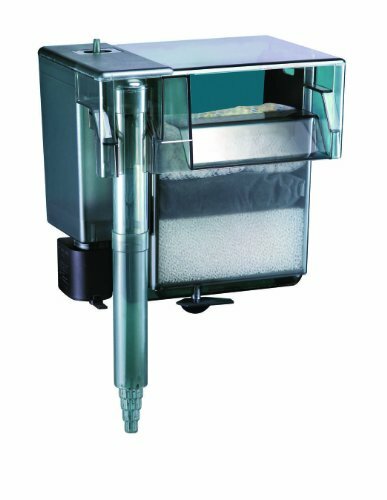 This over-hanging tank filter has a three-stage filtration mechanism, which makes it a capable product suitable for any home aquarium. With a motor that is submerged below the water’s surface, this model is quiet. Although the waterfall it produces may be rather loud, for anyone who loves the relaxing sound of water, it’s perfect. This filter also has a particularly strong flow, so is ideal for any fish that enjoy currents. However, in light of this, this it will not be the best choice for tank inhabitants that like calm water. For an additional touch, you don’t need to worry about complicated instructions when you receive it. With minimal setup needed, and one cartridge included, it requires almost no effort at all to get up and running. Dimensions: 5.3 inches x 5 inches x 7.6 inches. 75 GPH certified flow rate. Additional cartridges available on purchase. This small addition to your aquarium acts almost like a water feature for your tank. It’s ideal for anyone who wishes to keep some valuable tank space available for more fish or plants. If you think it would make a good addition to your home tank, find out more here. As described in the name, this fully submerged filter is super quiet. This is great for anyone who doesn’t want to hear their tank at all, for example, when sleeping. As it doesn’t hang on the side of the aquarium, it can be entirely stuck against the interior wall. This makes it less obvious, concealed within the shrubbery of your tank. However, this also takes up more space within the tank than an external filter would, so bear this in mind. In order to be cleaned thoroughly, you must remove the bottom to access the impeller. This could make it a little more difficult than other filters to clean and maintain as it needs removing entirely from the tank and could be a little fiddly. Nevertheless, it will function within as little as two inches of water—making it great for any tanks that require a shallower setup. For example, turtles and mystery snails require little perches to sit on. Due to this, the water will be lower in these tanks and this filter would be a good choice. This filter won’t just clean your tank water. It will also create a little waterfall for your turtles to take their morning showers! Dimensions: 4.2 inches x 4 inches x 8 inches. One pre-assembled Bio-Bag cartridge included. Suction cups attach it to the aquarium. Works well in shallower waters, as well as deeper waters. Being internal, it takes up space. There you have it, our top contenders for best filter for a 10 gallon tank, along with buying advice on what to look for when making your decision. Obviously, it’s entirely down to you which filter you choose in the end, as this is just a guide and the best for you will depend on your tank setup and individual needs. Nevertheless, we hope we have helped you to narrow down your choices. If you have anything to add on this topic, or simply have questions or even an anecdote, we’d love to hear from you in the comments below. Please be aware this page contains affiliate links and itsafishthing.com receives a small commission if you purchase anything after clicking through such links. This has no effect at all on the eventual price you pay and we’re thankful for your support. Hey there! I'm Brian, a lifelong enthusiast and fish keeper with a wealth of knowledge and experience on freshwater aquariums, that I love to share on this site. If you have any questions or need any help, please do ask in the comments section below, I'd love to hear from you and will help where I can. 5 Best Automatic Fish Feeders in 2019 – Essential for Days Away!